OnePlus has announced that the One ‘2014 Flagship Killer’ smartphone will available to buy without any invites in India on Wednesday.The third open sale for the OnePlus One smartphone in India will kick off at 10am IST on Wednesday via Amazon India. The company announced the news on its official forum. 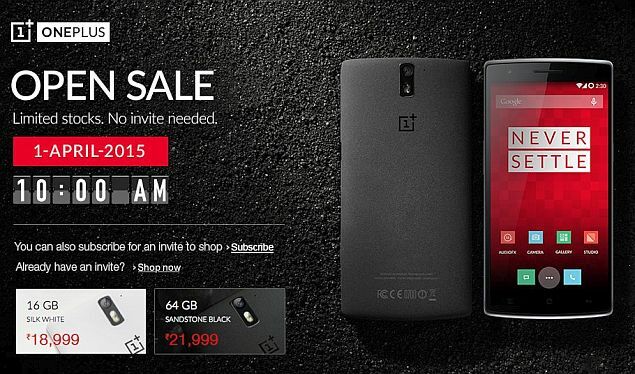 It’s worth noting that this is the second open sale of the OnePlus One within two weeks. OnePlus offered One smartphone without invites last week as well. An open sale for the One smartphone means that consumers will not require any invite to purchase the handset during the sale. The Chinese company as before has not revealed the number of units that will be up for sale on Wednesday; which means the handset will be available to purchase without invite till stocks last. Last month, the OnePlus One smartphone went up for sale in its first open sale in the country. The 16GB Silk White OnePlus One (Review | Pictures) will be available on Amazon India at Rs. 18,999 while the 64GB Sandstone Black variant is priced at Rs. 21,999. The open sale for the OnePlus One on Wednesday might be the last sale without invite before the company announces revised pricing for the India market. OnePlus recently hinted the prices in India may be revised soon. OnePlus has already hiked pricing of its “2014 flagship killer” smartphone, the One, for EU regions earlier this month citing the decline in value of the Euro, we can expect a slight hike in pricing of the handset in India as well. To recall, the OnePlus One features a 5.5-inch IPS LCD display with a 1080×1920 pixel resolution and offers a pixel density of 401ppi. The display boasts of Corning Gorilla Glass 3 protection. It comes with 3GB of RAM and is powered by the quad-core Qualcomm Snapdragon 801 clocked at 2.5GHz with Adreno 330 GPU. It sports a 13-megapixel rear IMX214 sensor with six lenses and f/2.0 aperture and also comes with a 5-megapixel front-facing camera. Connectivity options on the OnePlus One include 4G LTE, Wi-Fi 802.11 a/b/g/n/ac, Bluetooth 4.0, and NFC functionality. It features a 3100mAh non-removable battery.